MEXICAN TILE RENEW PROJECT AT UPSCALE HOME ON THE WATER SIESTA KEY FL. Mexican tiles are handmade and fired at low temps, and or baked in the sun. Mexican tiles are therefore not perfectly flat or perfectly shaped, giving the room they are in a softer, textured look. MEXICAN TILE RENEW PROJECT AT UPSCALE HOME ON THE WATER SIESTA KEY FL. Though Mexican tiles are available in a variety of colors, Mexican tiles are most often a terracotta beige, orange or red. Always seal Mexican tile floors with the appropriate sealant to maximize life span. MEXICAN TILE RENEW PROJECT AT UPSCALE HOME ON THE WATER SIESTA KEY FL. Mexican Tile, also known as Saltillo tile, is a very porous clay tile that requires special cleaning and sealing techniques. 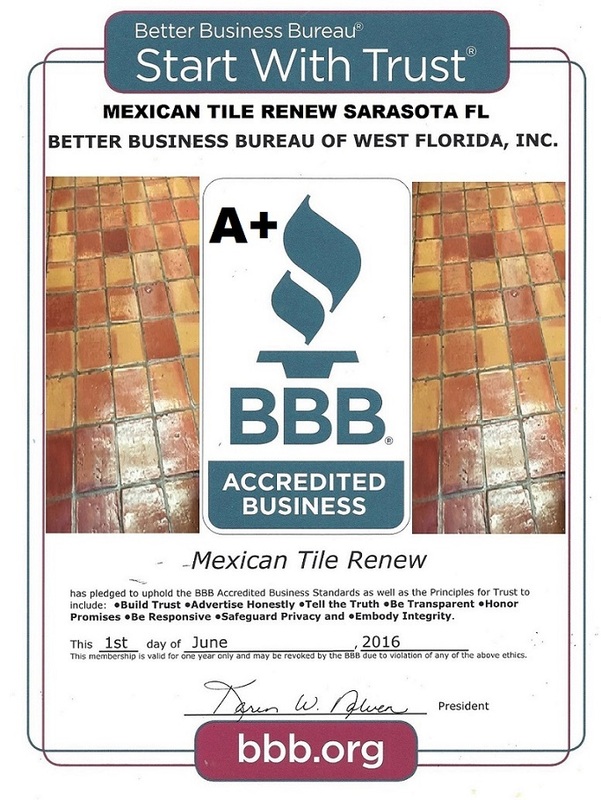 Mexican Tile Renew in Sarasota will strip off old sealers, clean the tile, and reseal to a like new appearance. MEXICAN TILE RENEW PROJECT AT UPSCALE HOME ON THE WATER SIESTA KEY FL. 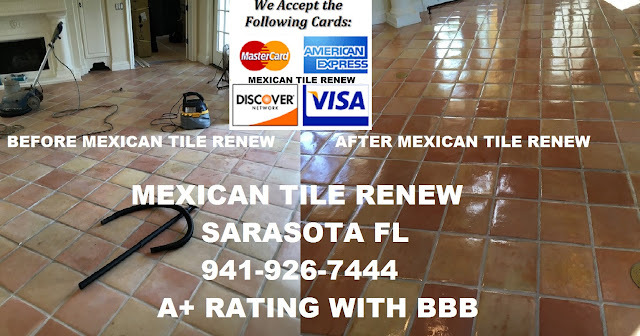 Never us vinegar or harsh chemicals to clean your Mexican tile floor, these cleaners will ruin the applied finish and discolor the tile, Mexican Tile is not Ceramic tile, it does not have a kiln backed on finish. The glaze you see in ceramic tile is baked on in kilns at temperatures ranging from 900F to 2500F, Mexican tile has an applied finish by hand. MEXICAN TILE RENEW PROJECT AT UPSCALE HOME ON THE WATER SIESTA KEY FL. We Make Like New the Good the Bad and Just Plain Ugly Floors. Call Vel at 941-926-7444 for pricing.